LeWeb 08 – it’s all about the people! The hosts, Loic and Geraldine LeMeur opens the LeWeb08 conference. A quick post about my experience at LeWeb i Paris as I head back to Stockholm full of inspiration. This years LeWeb proved more than ever that the value of conferences lies not so much in the content of the speeches or having famous people as presenters, as in the meetings between people. LeWeb managed to gather 1700 people from 30 countries and if you are open and curious it is hard not to be inspired by talking to them. I chatted with lots of video professionals, well-known bloggers like like Robert Scoble and many others that I wold never have found without LeWeb. For example I met several great people from the Czech republic,Â Eastern Europe seems to be very active in Internet business. If you have great people the practicalities are of less importance. 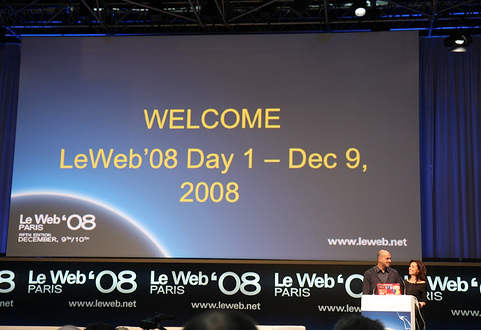 But I was negatively surprised to experience a much worse organised LeWeb this year compared to last year’s LeWeb. Everybody suffered from the very cold halls with bad accoustics and the lack of food and coffee througout the two long days. And like at most conferences, the Wifi did not work properly, not even for the presenters. The startups had to demo their internet businesses with slides… But the spirits were high, people made jokes about being “hardened for the recession” and the brasserie next door was packed with hungry, networking delegates. Update: here is Loic Le Meurs explanation on why things went wrong. For me the highlight of LeWeb was the talk by Chris Anderson, the organiser of the TED Talks. He must have the world’s best job, working with the world’s most interesting minds all year around! Enjoy his talk here, it is 20 minutes that could change your life! See the video here. Note his opening when he talks about our need of “continuous focused attention” amongst all the people in theÂ audience that where blogging, twittering, emailing, talking… I like the expression “continuous focused attention”, it is an important issue in these days of media noise, as real presence leads to mindfulness which we all need much more of. There were few Swedes attending LeWeb, but I was glad to see both Jonas Birgersson and Ola Ahlvarson up on the stage. Jonas was once more evangelizing super-broadband in a panel appropriately titled “European originals” and Ola was a judge in the startup competition. I chatted withÂ Johan Stael von Holstein in the audience, he was more confident than ever that his latest two ventures, MyQube and Snowfish will both be global hits and take on Facebook and MySpace. Great to see that these guys still have the glow! The Finnish entrepreneurs presented several interesting concepts in the startup competition and made the smartest PR trick with their “Sauna truck”, check out this video. This was a brilliant marketing idea that generatedÂ this brilliant blog post by Thomas Crampton. YouTube also presented their premium content channels that are enabling amongst all the professional media houses and organisations a new generation of video amateurs to make a living on YouTube (see NY Times article) showed some interactive functions. 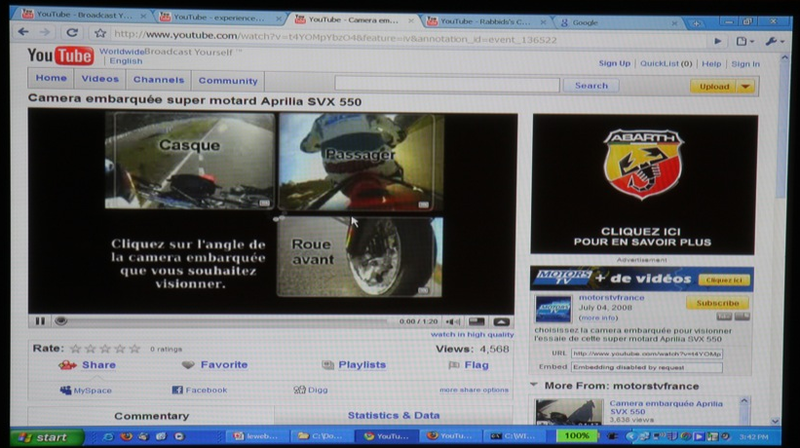 For example multiple language subtitling and in-video menus such as in this clip where you can select camera angle during a motorcycle ride. “Only people who where born rich have a problem with losing”. -People is everything. Good people can succeed with bad ideas, bad people can”™t succeed with a good idea”. Actually, regarding Czech and other eastern european projects, I totally agree that they can be interesting and would suggest to all “westeners” to work against their regular prejudice in this. There are plenty of people in Czech republic, Serbia, the baltics, Ukraine etc. that have come into technical ability the last ten years, they’re hungry and eager and what they may be lacking in fancy education, they can buy from abroad. Tack för den fina rapporteringen Henrik!